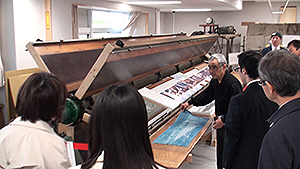 The Department of Intangible Cultural Heritage started a joint research on the spiderwort-dyed paper production technique with the Kusatsu Municipal Government in Shiga Prefecture from FY2016. Spiderwort-dyed paper is Japanese paper soaked in the extract from Asiatic dayflower petals. Spiderwort-dyed paper was a specialty of Omi Province, Tokaido, which was also referred to in an old book titled “Kefukigusa” ‘(written in 1638). The paper is used for Yuzen dyeing and tie dyeing even today. As for Yuzen dyeing, the water-soluble feature of the blue pigment of Asiatic dayflowers has been utilized. For Yuzen, coloring is performed after drawing a fine pattern with a solution prepared by submerging spiderwort-dyed paper in water, and placing paste for fine line printing like a levee to prevent dyes from penetrating. Spiderwort-dyed paper is indispensable for colorful dyeing with silk fabrics. However, there are only three producers of spiderwort-dyed paper left. In this joint research, with cooperation from such producers, we will organize its value as local and eventually national cultural property or heritage for utilization as basic data for future protection. We will examine how we will be able to hand down the spiderwort-dyed paper production technique transferred from person to person to the coming generation while making comparisons with cases in other districts. 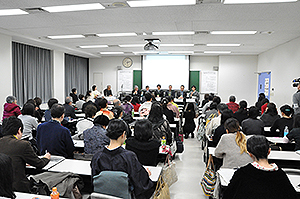 On November 11 and 12, 2015, the Department of Intangible Cultural Heritage held Seminar II on Passing Down Intangible Cultural Heritage (Traditional Techniques) “Passing Down Dyeing and Weaving Techniques and Regional Involvement” jointly with Kumagaya City. 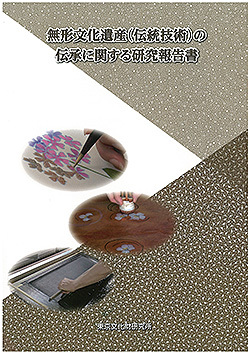 In connection with the previous seminar “The People and Tools that Sustain Textile Techniques” (held on February 3, 2015), we invited experts concerned from Kumagaya City in Saitama Prefecture and Kyoto City of Kyoto Prefecture, both of which give proactive support to the conservation and utilization of “tools” essential to dyeing and weaving techniques, for this seminar. We exchanged opinions on how administration could be involved in the conservation and utilization of “tools” as elements indispensable for dyeing and weaving techniques. On the first day, after the report on “Protection and Utilization of Tools” from a perspective of cultural heritage by Mr. Shunsuke Nakayama, Head of the Modern Cultural Properties Section of the Center for Conservation Science and Restoration Techniques of this Institute, Mr. Norihiro Oi of Kumagaya City Library gave a speech on “Protection of Kumagaya Dyeing Related Tools and Administrative Involvement,” and Ms. Naoko Kotani of the Traditional Industries Section, City of Kyoto talked about “Projects Supporting Dyeing and Weaving Techniques in Kyoto City.” At the comprehensive discussion following these presentations, opinions were exchanged vigorously over what administration could do, the importance of collaboration among people in different positions, and so forth. The audience also mentioned that it would be necessary to consider the collaboration with other “regions” with a focus on the “region” in which the technique to be passed down was rooted. 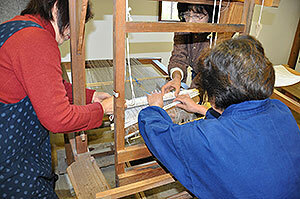 On the second day, after the lecture of “Small History of Modernization of Dyeing and Weaving in Saitama Prefecture – With a focus on Kumagaya Dyeing –“ by Ms. Kayoko Mizukami of Toyama Memorial Museum, we toured the Kumagaya Traditional Industry Passing Down Room (inside the Kumagaya city sport cultural village “Kumapia”). The long board rotary, water washer, and steaming box have been relocated with aid from the Pola Foundation for the Promotion of Traditional Japanese Culture. This seminar, where discussions were developed based on concrete cases on dyeing and weaving techniques and the tools supporting them, provided a good opportunity for us to recognize the importance of conserving tools anew for smooth and secure passing down of traditional dyeing and weaving techniques. The Department of Intangible Cultural Heritage will continually provide opportunities to discuss various issues surrounding traditional techniques. 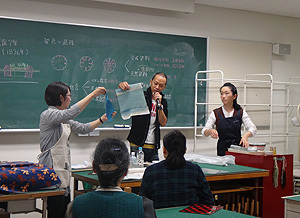 The Department of Intangible Cultural Heritage organized a workshop on Yuzen dyeing jointly with Bunka Gakuen Costume Museum on October 16 and 17, 2015. For this workshop, we invited Lecturer Takashi Seto from J. F. Oberlin University to focus on “Yuzen Dyeing” as a technique representing modern Japan. Comparison was made between the materials inherited from the early modern times (Japanese paper soaked in blue dayflower pigment, Yuzen glue, natural dyes, etc.) and synthetic materials in recent times (synthetic dayflower pigment, mucilage, and synthetic dyes), as well as their respective tools. On the first day, the current situation surrounding the production of materials and tools used for Yuzen-dyeing was explained together with images. Then, a series of processes were demonstrated: Drawing a design while making a comparison between natural dayflower pigment and synthetic dayflower pigment, masking with reddish glue made from starch glue, sappanwood and slaked lime, and undercoating with glue and ground soybean juice. On the second day, after learning the differences between natural and synthetic dyes, the remaining processes of coloring with synthetic dyes, steaming, and washing with water were performed. While steaming the fabrics to fix the dyes, the participants experienced masking with mucilage to learn the differences in the masking process from starch glue. At the end of the workshop, the participants discussed the “tradition” that they thought should be handed down. At this workshop, we could understand the relations among changing materials, tools and techniques through actual working processes, while sharing issues on techniques to be protected for handing them down to the coming generations through discussions with the participants. 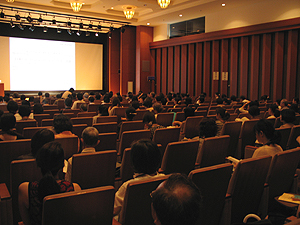 The Department of Intangible Cultural Heritage will continue to plan a variety of seminars to focus on diverse techniques. 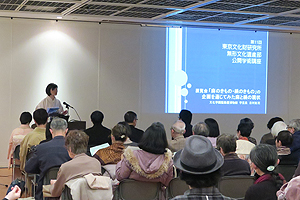 A seminar on passing down intangible cultural heritage (traditional techniques) was jointly organized by the Department of Intangible Cultural Heritage and the Bunka Gakuen Costume Museum on February 3, 2015. The title of the seminar was “The People and Tools that Sustain Textile Techniques Tools are essential to passing down textile techniques. The seminar featured a panel discussion of how those tools and techniques are related and the current state of those tools and techniques. FUJII Kenzo (of the Kyoto Textile Research Institute) was invited to comment. 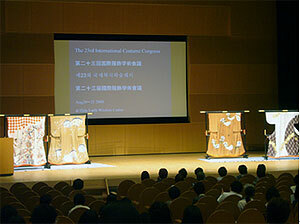 The panel included YOSHIMURA Kouka (a curator at the Bunka Gakuen Costume Museum), textile makers who were filmed for the exhibition, NAKAYAMA Shunsuke (Head of the Modern Cultural Properties Section of the Institute’s Center for Conservation Science and Restoration Techniques), and KIKUCHI Riyo (of the Department of Intangible Cultural Heritage). The textile makers described how they are continually confronted with a choice regarding which tools to use, i.e. whether to introduce machinery to increase operational efficiency or to continue using the tools they have inherited. 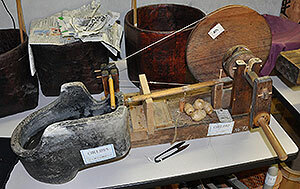 The textile makers also described how the techniques to make those tools have disappeared over the past few years. As a result, tools that were once readily available are no longer available, so craftsmen cannot inherit them even if they want to. That said, there is the view that only those techniques with accompanying demand should be preserved. Kimono are currently worn on special occasions. Kimono production is almost non-existent in comparison to the days when kimono were everyday wear. Textile techniques are a form of intangible cultural heritage, but textile manufacture also falls within the framework of an industry. Textile makers produced textiles to make a living, but that cannot happen if there is no market for those textiles. In other words, what sort of kimono do consumers want? Existing techniques can change depending on the answer to that question. The people that sustain textile techniques are not merely the textile makers. 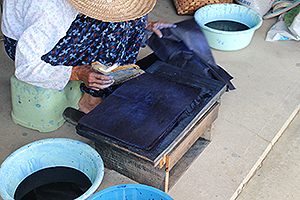 Each person who buys or wears clothing made from those textiles and wishes to preserve those textiles sustain the techniques used to make them. This seminar was meaningful since it impressed that fact upon a number of attendees. The seminar had numerous issues, such as time constraints, a lack of further discussion, and the fact that too broad a range of topics was covered. In the future, the Department of Intangible Cultural Heritage would like to draw on the views expressed by attendees and provide a forum in which individuals with different perspectives can discuss the passing down of textile techniques. 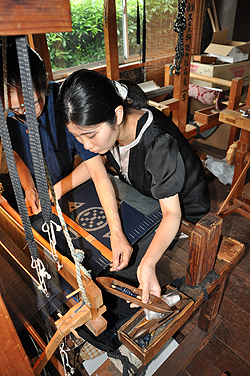 The Department of Intangible Cultural Heritage gathers information on and studies selected techniques to preserve traditional craft techniques. 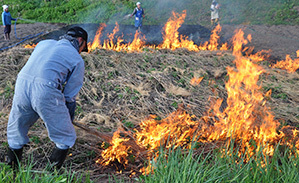 Riyo KIKUCHI of the Department of Intangible Cultural Heritage conducted a survey of techniques to produce araso　(the bark of hemp stalks). 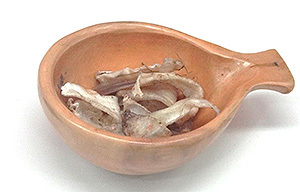 This technique is selected preservation technique. Kurume Ikat uses araso (to prevent dye from penetrating to fiber). Araso is currently made in the Yahata Family in the City of Hita, Oita Prefecture. 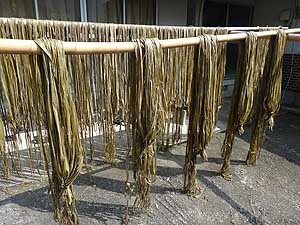 July, this hemp is harvested, steamed, and the stalks are peeled and dried . By change of society, this technique is difficult to inherit technique with one family. 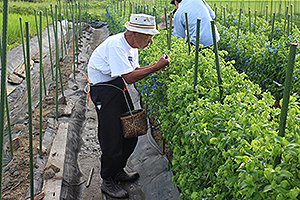 In light of these circumstances, members of an important intangible cultural property Kurume Ikat instituted a system last year to help with work. The Cannabis Control Act made obtaining araso more difficult, and the material is not as easy to obtain as it once was. In the future, ways to remedy situations like this need to be considered from various perspectives. The 35th International Symposium on the Conservation and Restoration of Cultural Properties was held at the Heiseikan Large Auditorium, Tokyo National Museum from Sept. 3 to 5, 2011 with “Tradition and Transmission of Textile Techniques: Present Condition of Research and Conservation” as its theme. At the symposium, domestic and foreign experts from various disciplines related to textiles, such as craftsmen, restorers, curators, and researchers were invited to discuss the “making,” “protecting,” and “handing down” of textiles. This symposium sought to suggest directions for future research on textile techniques. Particular focus was placed on problems with raw materials and tools encountered during the making and restoring of textiles, the nature of the system to educate successors to pass on these techniques to future generations, and multifaceted approaches to the study of textile techniques. Two keynote speeches given at the beginning of the symposium dealt with the fundamental themes of textile techniques, such as the fact that these techniques had inevitably undergone change over the years and that some of techniques had been lost in that process. Following the keynote speeches were 4 sessions on Protecting of Textile Techniques, Textile Conservation Today, Approaches to Textile Techniques, and Transmission of Textile Techniques; these sessions were followed by a general discussion. Each session included interesting presentations dealing with problems such as advice on handing down textile techniques from the craftsmen’s points of view, the history and current state of restoration techniques at home and abroad, methods of studying domestic and foreign textiles and other related materials in order to advance research on textile techniques, and the education of successors to carry on these techniques. 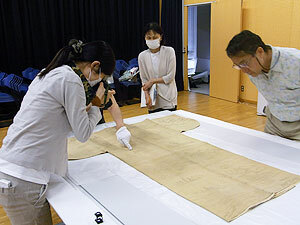 In the general discussion, problems commonly encountered by participants were discussed, such as how to conserve textile techniques that inevitably change over time, technical problems that craftsmen and restorers face, and differences in concepts of keeping modern textile collections in Japan and abroad. There was not enough time to delve deeply into each problem, but the participants praised the symposium as a significant opportunity to discuss present problems and to build new networks among colleagues. Plans are to publish details of the symposium in proceedings next year. As part of joint research at the Joint Research Center for Fashion and Clothing Culture, we surveyed the textiles at the JAM on July 12, 2010. 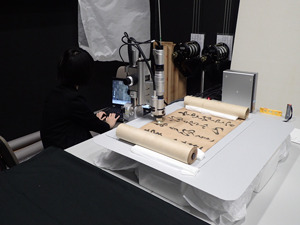 This joint research started in November 2008, aiming to clarify the relationship between the Mitsui-family descendent short-sleeved (kosode) kimono owned by the Bunka Gakuen Costume Museum and the associated Maruyama-school costume design. We conducted the detailed survey on the short-sleeved kimonos, which were in the possession of the now-defunct Kanebo Ltd. and now owned by JAM, focusing on those similar to the Mitsui-family descendent kosode, including the techniques, design and tailoring. We will advance a close investigation on the findings obtained through the surveys, aiming at the issue of a report in next fiscal year.